RICO. That acronym for the Federal Racketeer Influenced and Corrupt Organizations Act of 1970 represents the single most dangerous threat to gun rights looming on the near political horizon. It is the hidden centerpiece ofU.S. Sen. Chuck Schumer’s, D-N.Y., anti-gun-rights legislation--S. 77--and the absolute short-term lobbying target of New York City Mayor Michael Bloomberg’s axis of 160 urban mayors throughout the country. RICO, when it was enacted in 1970, was intended to make prosecutions of organized crime figures easy, and was called the “hydrogen bomb” of federal criminal law. It lifts all manner of normal due process and lowers the burden of proof needed to convict defendants. And it empowers federal authorities to freeze all assets of RICO defendants upon mere indictment so that they are denied the means to pay for a defense. One measure of any law--no matter how well meaning the sound of its title--is how it will be administered in the wrong hands. For RICO, the wrong hands could well be the next presidential administration. Or it could be a rogue blue-state mayor or urbanU.S. attorney. Remarkably, there is nothing in RICO that is not already illegal. Rather, it creates a new layer of criminal acts called “derivative crimes” based on what the law spells out as “predicate” crimes, which include violation of any law or even regulation specifically named as “predicate” under RICO statutes. Two such “predicate” offenses within a 10-year period is the standard for creating a RICO prosecution. For RICO to kick in, there is no requirement of conviction involving an original “predicate” allegation. RICO also provides federally assisted avenues for “racketeering” civil actions under which individuals or organizations can sue other individuals or entities and collect triple damages. Such suits--especially when tied into RICO provisions providing loose allegations concerning “racketeering conspiracies”--would resurrect the big-city agenda to kill outright or extort total control over lawful firearms commerce in America. Among the bizarre legal theories that drove a series of New York City lawsuits against the firearms industry was the absurd notion that a conspiracy existed among lawful firearms producers and distributors to intentionally “overproduce guns” to ultimately fill a huge illegal gun market run by criminals circumventing federal law. It was, of course, an insane theory, but clearly with RICO as a tool, a future attorney general in, say, a Hillary Clinton administration, could revisit such theories and likely prevail. In fact, were S. 77 or any similar legislation expanding RICO to become law, RICO provisions could wipe out any protections against new punitive lawsuits that were ostensibly ended by enactment of the Protection of Lawful Commerce in Arms Act of 2005. But there is an even more evil side to RICO civil action--punitive suits to take down opponents on purely political hit lists. In fact, were S.77 or any similar legislation expanding RICO to become law, RICO provisions could wipe out any protections against new punitive lawsuits that were ostensibly ended by enactment of the Protection of Lawful Commerce in Arms Act of 2005. Keep in mind that a series of civil RICO actions was indeed brought by the National Organization for Women against individuals and groups alleged to be involved in peaceful picketing of abortion clinics, claiming “extortion” as the predicate offense. Ultimately, theU.S. Supreme Court threw out those actions, but considerable damage was done to many groups and individuals all the same. As for the immediate short-term goals of Bloomberg and Schumer, look no further than S. 77. The same RICO civil litigation tools that are ready-made for destruction of the firearm industry could also become the means to vindictively pursue individual gun owners. If applied to federal gun control statutes as prescribed in S. 77, RICO would open the way for unprecedented civil liberties abuses against Americans who practice the Second Amendment. Remember, to trigger a RICO prosecution, federal authorities only need to claim “a pattern of racketeering activity” based solely on allegations of two or more RICO predicate violations within a 10-year period. 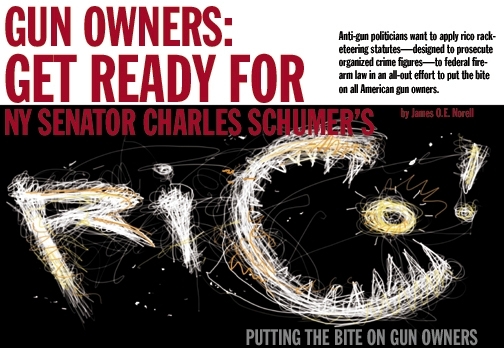 For a federal firearm dealer living under Schumer’s S. 77, such a “pattern” could entail two simple paperwork errors involving anything Schumer might claim to include “illegal gun trafficking” within a decade, or any number of unknowing, innocent business mistakes. Once RICO comes into play, the dealer, or an accused individual, is subjected to a whole new set of procedures and rules that make defense difficult, if not nearly impossible. While the current burden of proof for conviction of a Gun Control Act “predicate” charge is the high constitutional bar of “guilt beyond reasonable doubt,” the burden of proof for the racketeering “derivative crime” is merely that required in civil cases--guilt based on the “preponderance of evidence.” There is, of course, an enormous difference. But what makes RICO so dangerous for firearm owners and those in the lawful trade of firearms is that knowledge--“state of mind”--is neither a defense nor a requirement for prosecution. Where many predicate crimes require overwhelming proof that they were committed “willfully”--that is, intentionally, with full knowledge of the law and its consequences--RICO derivative crimes require no such state of mind. Nothing. A breach of the law alone constitutes the sole evidence considered by a court. Yet there is another “state of mind” issue that also factors into the inherent dangers of RICO--the malicious state of mind of those who would abuse the law to federally prosecute gun owners. It is obvious how RICO could be used against any business entity or person in the lawful chain of federally licensed commerce. Yet what about individual gun owners? What about the danger to any organization a RICO defendant might be associated with or have membership in? Under RICO, federal prosecutors could claim such an entity is a related “racketeering enterprise.” Gun clubs. Collectors’ associations. The NRA. All could be in danger. For firearm collectors, and especially for ordinary, casual firearm owners who know little about federal gun laws, there are already provisions on the books that present a terrible potential danger for individual gun owners under RICO. For example, it is a federal felony to transfer a firearm from one individual across state lines to another without going through a federally licensed dealer for the transaction.